While the Word of God needs no explanation, we sometimes need a reminder to sink deep in our study of it. Come to Christ and find rest. Learn from Christ and find rest. 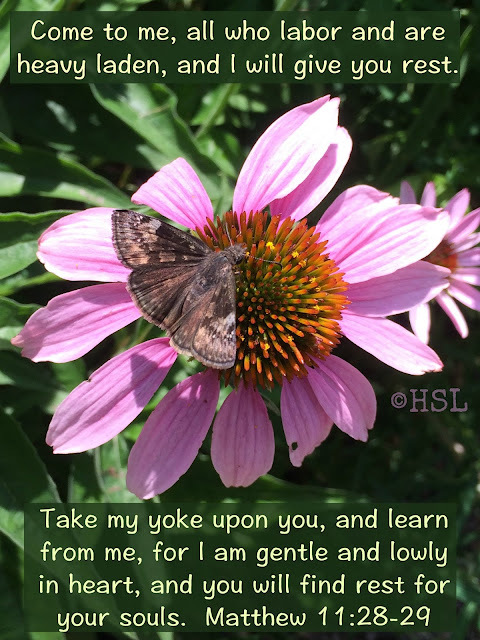 Lead your children to Christ and show them gentleness and rest for their souls. 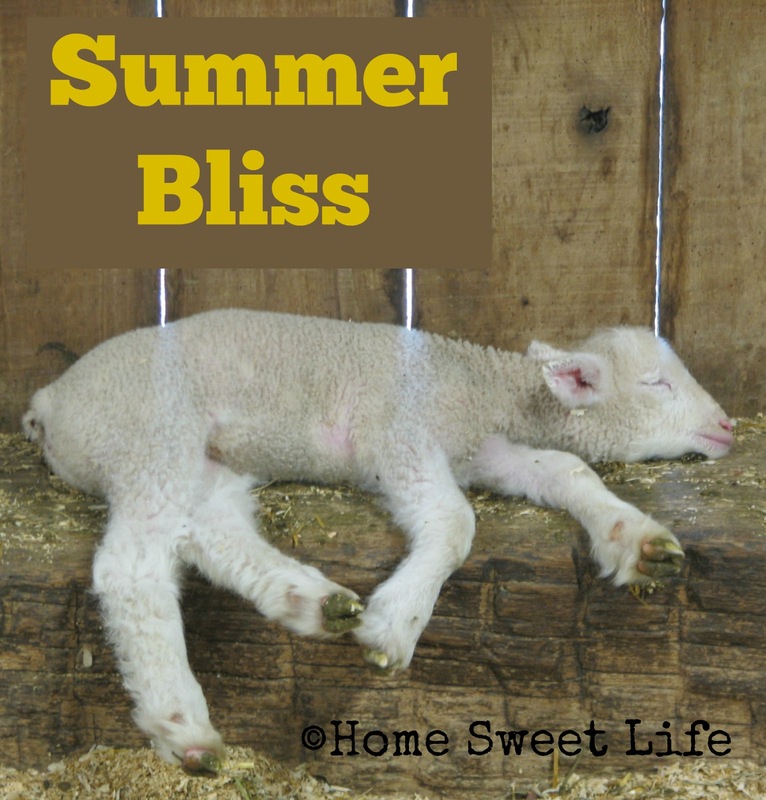 This lamb serves as a poignant reminder about summer. Summer can be filled with activities from dawn until dusk, but it also needs to be savored! Look again. See how relaxed the lamb is? It is taking a nap on a foundation beam in the barn. It has no worries at the moment. It is trusting its Mama to keep watch over it. If you are the Mama who is keeping watch over your little lambs, stop and think about how they react to your summer schedule. Are your little children relaxed? Are they resting secure knowing that you are watching over them? If you are keeping a frantic pace trying to fit everything in ~ stop! Your summer should be mix of restful bliss and memorable activities. It needn't cost you any more than any other season of the year. In fact, it might be the easiest time of year on your budget: no schoolbooks, no winter coats, and plenty of fresh choices at the local Farmer's Market. If you cannot remember when the last time you stopped and rested was, then choose today. Rest in God's grace, rest in the peace that Christ gives. In Psalm 46 the Israelites were commanded to "Be still, and know that I AM God; I will be exalted among the nations, I will be exalted in the earth." We cannot follow God's command to know that He is God if we cannot be still. If you have lost your sense of wonder at the power and majesty of God, you are too busy. If God is not being exalted through your words and actions, then you are too busy. Take time today, even just five minutes right now and focus on the beautiful world around you that God has created. Focus on the Creator and Giver of life. Choose today to be one of His sheep, who going in and out and finding pasture. Rest secure knowing HE is in control and guards the gate. Find your rest in Christ alone. Find a moment of summer bliss when you put aside your own agenda for the day and lay down to rest at His feet. Just as the Ewe sheep cares for its lamb, God cares for His children. God's love knows no boundaries. Rest in Him today. Today we are once again featuring Arlene as the main writer of our review. See below for Carol's additional comments. For those of you who have been reading our blog for a while you will know that this is the fifth Heirloom Audio Productions audio theater set. We have reviewed all five titles and I will tell you that you will not be disappointed as they just keep getting better. The Extraordinary Adventures of G.A. 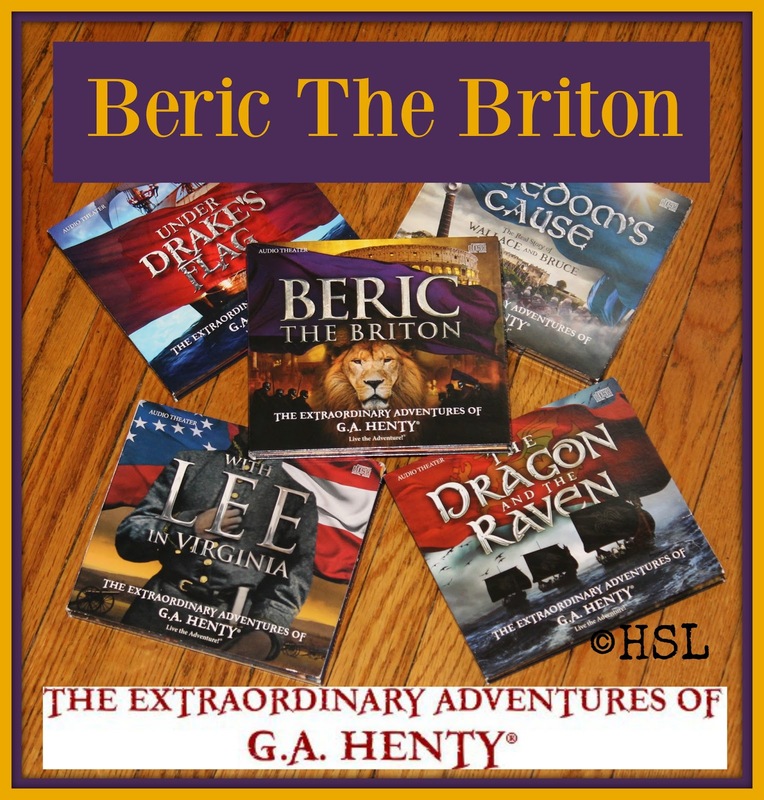 Henty: Beric the Briton is about the Roman invasion of ancient Britannia in this story Beric and his best friend Bodouc have the journey they will never forget. During the story Beric and Bodouc are enslaved by the Romans, sent to be trained as gladiators, and then gain their freedom while working for Emperor Nero. When a mysterious story circulates about a man named Christus, Beric and Bodouc are forced to confront the pagan religion they thought to be true. Through this they learn how to overcome their wish for revenge and discover forgiveness through Christ. A romance: What is a good adventure if you don’t get the girl in the end? Usually the girl is at first on the opposite side from the hero. It makes a good plot point. Lots of adventure: Every story takes you to exciting new (and real) places, with intriguing conflicts. A good friend: There always good to have in tight situations. They are long: Don’t worry these audio adventures take long (and sometime dry) books and make them come alive. Real people: Part of the fun of historical fiction is meeting famous people from throughout history. A different take: A lot of Henty’s stories’ main characters are on what history usually tells you is the wrong or loosing side. Having stories from the “Other side” can help give us a full picture of a particular time in history. A romance: Yes, usually the girl is at first on the opposite side and this is true in Beric the Britain; Amelia is a Roman. Lots of adventure: Definitely yes! This story includes everything from battles in Briton, to ship wrecks, to Colosseum fights. A good friend: Bodouc in this case. He is loyal and brave some of the best things you could ask for in your best friend. They are long: I not sure exactly how long the original book was but this story is about 2 1/2 hours. Its never dull, I would say it my even be more exciting then most adventure movies. Real people: What are fictional characters compared to Queens and Emperors? In this story you will meet Queen Boadicea and Emperor Nero. Both powerful and fascinating people. A different take: Most history books just tell you that the Romans conquered everything. But what of the people they ruled? How did they feel about the Romans? Here is you chance to find out. We loved all four previous Heirloom Audio Productions and this one is no different. We have listened to it several times already! Just like the other four it comes with two disks and we also received the digital study guide which is full of great discussion questions to help you further explore history in the early A.D. years. At the beginning of the story Mr. Henty tells Ned and Gerald of a new story about Ancient Egypt. The next Heirloom Audio Production: The Cat of Bubastes comes out later this year and it is already on The School House Review Crew list of upcoming products, I can’t wait! These stories are fun for the whole family so get your copies today and start listening. Besides the two-disc Audio Theater production, we also received several bonuses: Beric The Briton MP3 set, Beric The Briton E-book, Official MP3 Soundtrack, Printable cast Poster, PDF Study Guide and Discussion Questions, Printable Inspirational Verse Poster, and access to the 35 minute Behind the Scenes Videos. If you're thinking that is a lot of extras, you would be correct! We enjoy listening to the soundtracks from the Audio Theater productions and the behind the scenes videos, but what I want to focus on is the Study Guide. The Heirloom Audio study guides are a treasure trove of learning that go right alongside the CDs. Each major part of the story has three additional sections in the Study Guide: Listening Well, Thinking Further, and Defining Words. The defining words section is easy to understand. Not everyone will know all of the unusual words in this Roman Era story before you put in the first CD to listen to. Words and terms that you may need to look up the definitions for include: Druid, Tiber, legion, scourge, toga, paces, cower, insolence, reverberation, and military standard. These are just some of the words listed in the first few sections. Because it has been so long since I studied Roman history, I found myself stopping to think about the words use door ethane I had in previous Heirloom Audio Productions. The Listening Well and Thinking Further sections really turn this Audio Theater into a unit study for the entire family. They ask questions designed to help you gain a better understanding of daily life, superstitions of the time, and the Druid (pagan) religion. All throughout the study guides you will find extras to enhance your learning. It begins with a brief biographies of G.A. Henty, Queen Boadicea, and Emperor Nero. If you have not yet studied Roman History, I would suggest looking through these biographies and the first section of the Study Guide before you begin listening to the story. What I love most about these Henty stories from Heirloom Audio Productions is that they entertain and educate, while always pointing our family back to the truth of Christ! No where else have I found audio theater so masterfully well done that still challenges and convicts us to look at our own lives and choices while keeping us on the edge of our seat. No one ever wants to get out of the car at our destination if we are listening to one of our Heirloom Audio sets! We would love to have you read our previous reviews as well! For the past six weeks, Arlene and I have been reviewing The Power in Your Hands: Writing Nonfiction in High School, 2nd Edition. 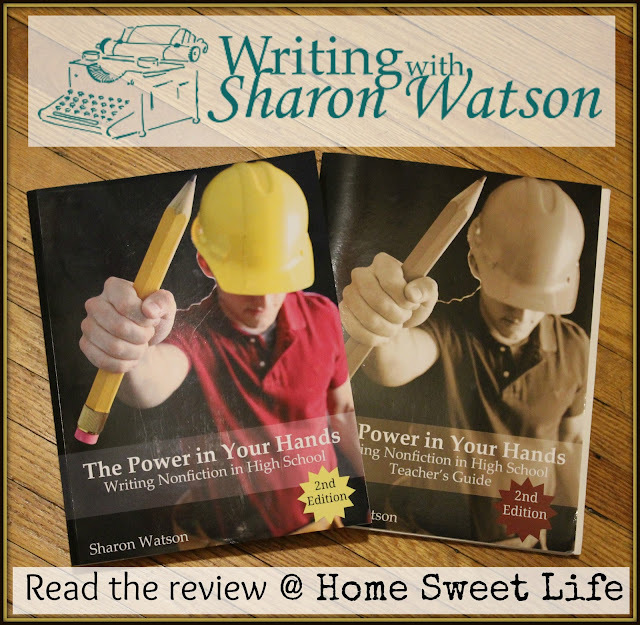 We were excited to be on this review from Writing with Sharon Watson for the Schoolhouse Review Crew for two reasons. The first is that we’ve always been impressed with the curriculum written by Sharon Watson, the second reason is because we’ve come to know Sharon as a family friend over our years on the Crew and wanted to introduce her to even more of you. We received both the 428 page Student Textbook and the 232 page Teacher’s Guide. Because this product is designed to help your High Schooler improve their writing skills, Arlene wanted to write the bulk of this review for you. Please read all the way through to the end of her part ~ you’ll be glad you did! I’ll include some additional thoughts of my own after her review. You may remember that we have reviewed other Products from Writing With Sharon Watson before those products range from Writing Fiction (in High school) to Illuminating Literature: When Worlds collide. This time we are reviewing The Power in Your Hands: Writing Nonfiction in High School . 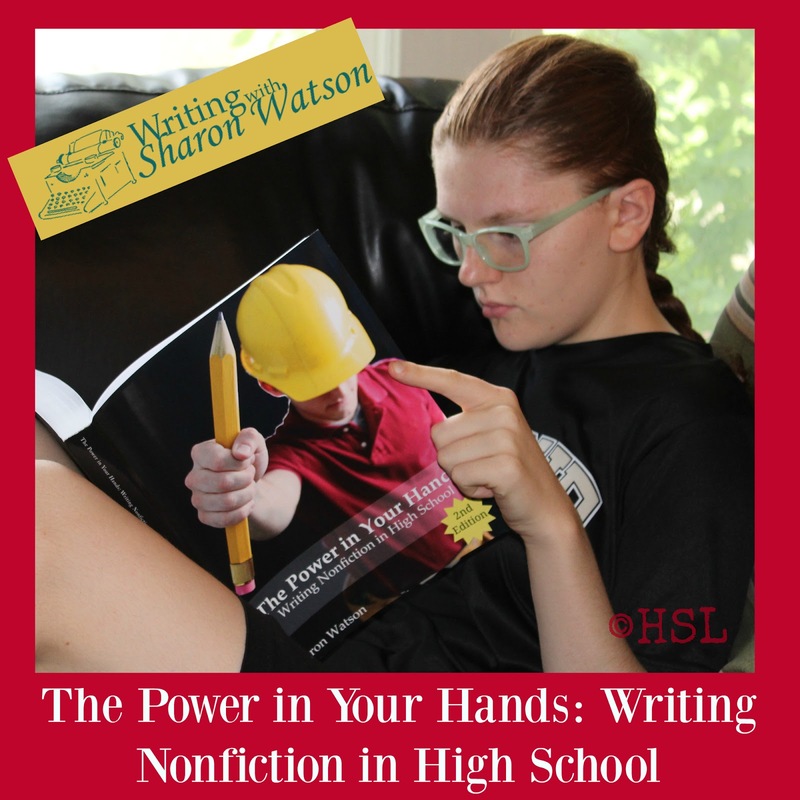 The Power in Your Hands: Writing Nonfiction in High School is kind of a long title so from now on I will just call it tPiYHWNiHS. Nope that is still kind of long so I will just put PYH:WNFHS. Wow thats still kind of long, so lets just go with NFIHS. (Non-Fiction in High Schoo.) Well it doesn't matter how long the title is it is still a fantastic set of books. 1. Easily keep track of daily work with newly numbered lessons. 2. Teens learn common grammar mistakes (7 lessons). 3. The emotional appeal speech is shorter and easier to understand. 4. Students can look up items in the new index. 5. Grading essays just got a lot easier! Specific grading grids in the Teacher’s Guide are designed for each essay assignment. Parents have asked for this, and these grids will make grading student essays MUCH easier! 6. The chapter on the old SAT essay has been removed. Find info on that essay here. What grade levels is this for? Can I use it for homeschool? The material sounds difficult. Is The Power in Your Hands for college-bound students only? I've heard I can use The Power in Your Hands for more than one year. Is this true? We don't have two years. My student is a senior. How can I use The Power in Your Hands? How do I grade my students' papers? Will my student learn how to proofread his or her own work? The text uses humor, and some of the writing assignments are light-hearted. Why doesn't the curriculum teach students how to write about important issues? I could give you the answers to these questions but that would make this review really long so I will just put the link to the web paige in here again. I have now put the link to the page in this review at least three times so you have no excuse not to go look at this grate product. $20.00 for the teachers guide. As a student I don’t know much about the cost of curriculums as mom pays for all of mine. (Or we get them as reviews), but personally I think this is a good price. I have put in this review a few Incorrect homophones, misspellings and incorrect punctuation - did you spot them? (Im not done with them yet). If you did congratulations! (I Will admit that I am terrible with homophones so I don’t know haw many there are. Maybe Mom can tell me.) If not you might want to get yourself a copy of NFIHS to help refresh you memory. Remember we might not all be professional Editors but at least you can make sure that whatever you write is done correctly and to the best of your ability! 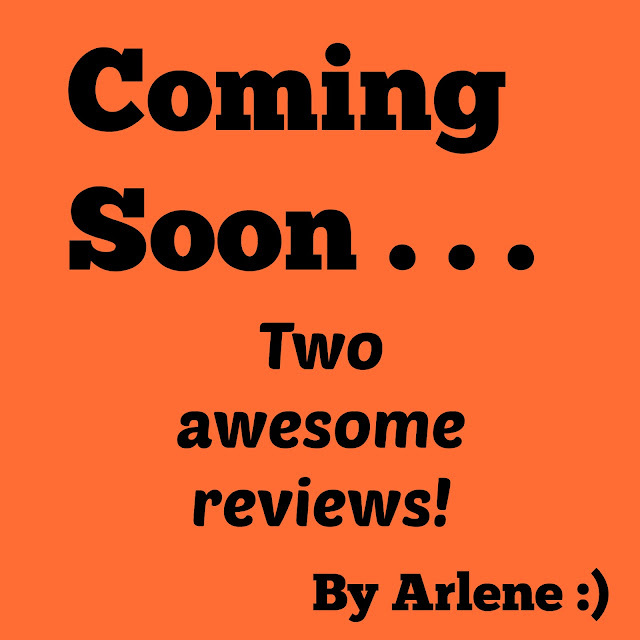 Did you enjoy Arlene's review? It made me laugh! Many parts of the first chapter of the Student Textbook (Before You Write) are expanded upon in the Teacher’s Guide. Sharon gives parents/ teachers a lot of sound advise gleaned from her many years as a classroom teacher about how to nurture and encourage reluctant writers. Her plan is simple, yet effective: plan, write, fix. In the Student textbook she uses a lot of humor to keep the student’s attention, and then helps them learn to write nonfiction well without sounding stuffy. Because I’ve been writing a monthly newspaper column recently, I decided to use Arlene’s Student Textbook and brush up on my skills. Chapter 15 includes 8 lessons on writing newspaper articles. Like the other chapters with an essay-type assignment, it includes an assignment checklist as well as a planning grid to help your student better manage their time and complete their assignment by the due date. This chapter was a good refresher for me to use as I continue to write for our local paper. Once again I was impressed by the depth of material covered in The Power in Your Hands while still maintaining an ease of use that lets the student work independently. The new grading grids simplify the process for the teacher, and help the student pinpoint their weak areas that need improvement in their future assignments. Writing well, especially nonfiction, takes time and practice. Sharon Watson scores an A+ for making the process understandable and interesting for a wide variety of students. Her humor throughout this course reminds the student that writing should be enjoyable, not something to be feared. She also gives great suggestions for each assignment’s length (word count) based upon the student’s writing level when they began the course: beginner, intermediate, or accomplished. This course is an exceptional investment in not only improving your child’s writing skills, but their confidence in presenting a position orally as well. As they learn to research and plan, they gain confidence when sharing with others. For parents, you might want to read through the chapters on Proofreading, Common Grammar Mistakes, and Letters & Emails for yourself! To read the other Crew reviews, click the banner below! We have just ended what are two of the busiest weeks of every year . . . those last two weeks before our 4-H fair. Those weeks filled with the girls putting the final touches on their projects, running to Hobby Lobby for whatever one of them missed on the last trip, and getting all the projects to judging on the correct days. Before and during this time, Arlene and I have been reviewing a couple of really neat things that we are going to tell you about later this week. I wanted to give you a head's up because Arlene decided she wanted to try writing the bulk of these reviews, instead of just adding on to mine. One of the reviews is for a writing program, so she put her new-found skills to work! The other is an audio adventure. She has also written a third review ~ which we will share in a couple of weeks. I am really impressed with her reviews, and I think you'll enjoy them. It has been almost too busy, and Arlene's help with writing the reviews has left me time to do other important things . . . like sleep! Stay tuned, I hope to get Arlene's first mostly-solo review up tomorrow or Wednesday. A few months ago, I started doing something I hadn't done since college . . . really, it is something I haven't done regularly since High School. 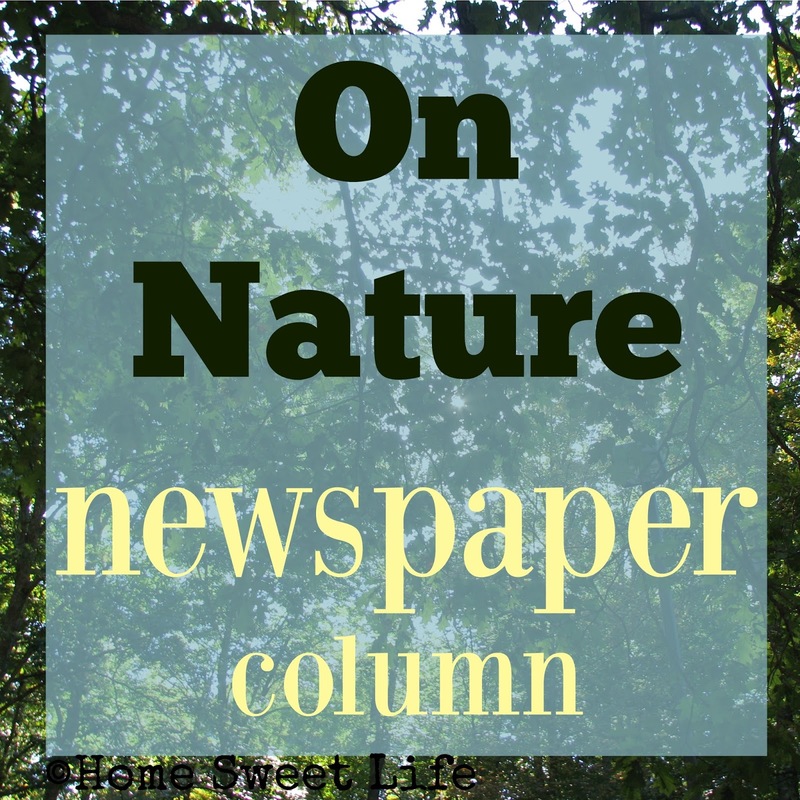 I started writing a column for the local newspaper. It is not just me writing the column. I am one of four people from a local community group who has joined forces to write for the newspaper. It has been a long time since I've seen my name in print. It's kind of fun, and sometimes really challenging. The three other writers are friends of mine, and that makes it easier. Kevin is a botanist, as well as a meteorologist, and often writes about flowers or trees. Sheryl is a retired teacher and likes to write about wildlife. Eliot is a historian by trade, as well as an artist. He comes up with lots of interesting pieces about local natural history, as well as some folklore. So why am I one of the writers? On paper, at least, I don't hold any spectacular degrees or legacies. What could I possibly add to this already great group to hold up my every four weeks' commitment? Hmm . . . what could my expertise be? Frugal family fun ~ outdoors! I'm hoping that God keeps giving me inspiration for the articles. So far, so good. All this to say, if you'd like to get some ideas for outdoor frugal family fun, why not go check out my past columns? Just click the links below. Oh, just in case you're wondering ~ I do NOT write the headlines ~ LOL! What would happen if I . . . Researched the facts before forming an opinion? Actually prayed daily for those who are annoying to me? Chose to answer wrath with a soft word? 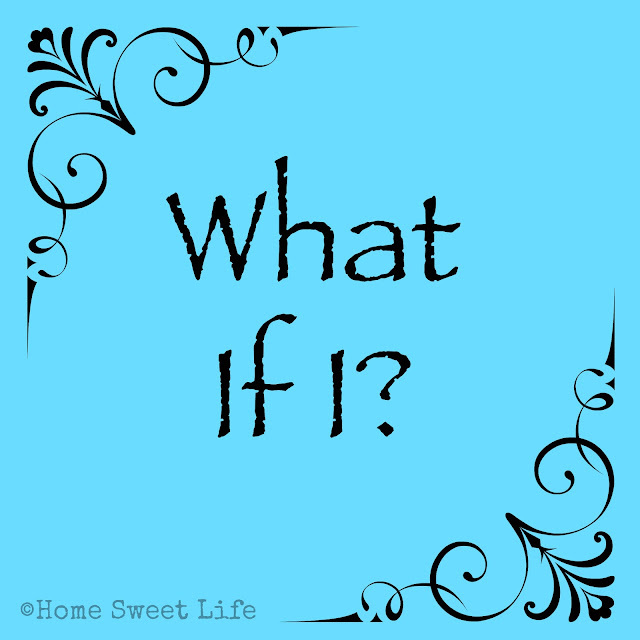 Prayed for my children instead of yelling at them when they disobey? Decided I didn't always need to be right? Earnestly sought after God's plan for each day? I would be content with what I have. I would be more like Christ! Today I am going to choose to be more like Christ, and less like my old sinful self. Will you join me in choosing this better way? The way of Christ that brings peace to our lives and our homes. The way that holds no grievances and looks to the eternal rather than the temporary. Choose today to love those around you. Choose to let Christ make a difference in your life. Choose Christ.